Since reptiles are easily susceptible to bacterial infections through the skin and digestive system, their cages and cage items need to be regular cleaned. 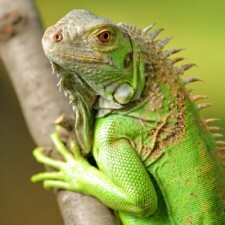 Learn how to successfully clean your reptile’s cage from a Waterloo veterinary professional. Before you start vigorously cleaning, it’s important to be aware of the proper cleaning schedule for your particular reptile. The frequency of cage cleanings will vary based on what kind of reptile you have, as well as other factors like size and habitat. The best thing to do is call your veterinarian and ask what sort of cleaning and care requirements are necessary for your reptilian pet. Of course, you’ll need to clean out your pet’s cage daily, removing uneaten food, feces, and other waste. You may have to remove soiled bedding and replace it with new. To clean your pet’s food and water dishes, remove them from the cage and wash them with hot water and soap for several minutes. Scrub them thoroughly to remove all waste and loosen tough spots, and rinse them completely before returning them to the cage. For other cage accessories, like rocks, hiding spots, or branches, you can clean them with soap and water in the same manner, and try boiling them in water for up to 30 minutes. This will kill any harmful bacteria and thoroughly disinfect your reptile’s cage accessories. Ask your Waterloo veterinarian for more helpful tips. When you’re ready for a weekly cage cleaning, relocate your reptile to a back-up cage, stocked with everything he’ll need for the duration of the cleaning session. Remove all accessories and decorations in the cage, and remove the bedding. Use a sponge or cleaning cloth and begin cleaning the walls and floor of the cage with hot, soapy water. Use a putty knife or toothbrush to loosen tough spots. Rinse everything off thoroughly and let objects air dry. Once everything is dry, you can use a disinfectant. Ask your veterinarian about a safe product to use. After everything is disinfected and dried out, you can return the items to your pet’s cage, and then replace your reptile.